Mauger Fitzhugh Monk was born in the British channel island of Guernsey. Forced to leave England after a financial scandal, he departed for India, where, under an assumed name, he enlisted as gunnar, in the East India Company’s 4th Battalion of Artillery. He served there as a soldier but soon made his way up to the Himalayan hill station of Mussoorie, which had then only recently been established, and took up work there; initially as a teacher. He augmented his teaching work with various commercial undertakings, the failure of which, pushed him to the edge of bankruptcy. After an extremely eventful career in Mussorie, he finally decided to return to England, but sadly died suddenly in 1849, at Meerut. He recorded the details of his extraordinary life in India, in a long series of letters, written to his father and other family members in England, between 1828 and 1849. They record his army life, in the late 1890’s, and then go on to give a fascinating, and previously unknown insight, into everyday life in Mussoorie and Landour, during the 1840’s. The collection is an invaluable resource for all who are interested in the social life of 19th century British India, and in discovering new aspects of history of Mussoorie in its very earliest days. 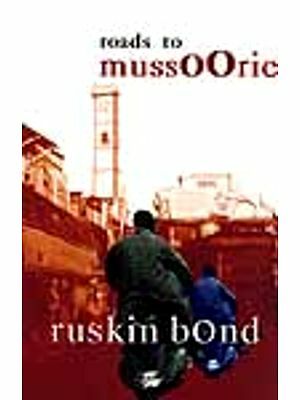 Ruskin Bond, Well-known as one of India’s best-loved and most prolific writers, has been in residence in Mussorrie for almost half a century now. From his perch in Ivy Cottage, he has written novels, poetry, essays and short-stories which have brought joy to his readers from the simple, uncomplicated things in life, often raising the experience to the sublime. This collection of letters tells story of the hill-station in the days of its infancy. His friend Ganesh Saili too, settled atop a spur in Mullingar, has had the good fortune of living in the hills, and seen the changing facets of the hill-station. For forty years and more, he has researched and trekked the high mountains, capturing in words and film the awe-inspiring beauty of the hills. Numerous periodicals, journals awards are a testimony to his roots. Mauger Fitzhugh Monk was just the sort of person you would find in a Kipling story, had their paths ever crossed. In the late eighteenth and early nineteenth centuries many Europeans came to India in search of the pagoda tree, symbol of unlimited wealth and treasure. Some did indeed make their fortune; others ended up in the bazaars and byways of that' great grey formless India' that so fascinated Rudyard Kipling. However, Kipling came to Simla and Mussoorie many years after Mr. Monk had departed from this earth. Monk's tenure was brief. He arrived in Mussoorie in 1840 and left in 1849, dying in Meerut on his journey back to England and the Channel Islands. Like the thousands who occupy the only land they still own when they die, Monk would have passed into oblivion but for the fact that his family preserved his letters and they have come down to us today in the form of this fascinating collection of correspondence, which reads like a novel-a story of strenuous endeavour met by total failure. Yes, Monk was a failure. A failure at almost everything he attempted. And that is what makes him so fascinating. Because he could so easily have been you or me. If we survive, it is by dint of failing and trying again, and failing better! Success stories are usually boring. The road to riches is usually built through the labours of those who are quickly discarded. You take someone's help and then bid goodbye to your helper. But Monk wasn't smart enough to do that. He tried running a hotel, he tried running a school. He tried various things. But he was outsmarted by the big bosses, those who were already entrenched in the fledgling hill station; the likes of Mackinnon, who set up a brewery and made a fortune selling beer to parched British soldiers convalescing up at Landour. Good old Mackinnon, he placated his conscience by helping to build a church a road and a school, and making sure that others did not compete with his establishments. The road, naturally, led to his breweries. Monk's school survived somehow, in spite of the failure of his other business interests. He married a pretty Eurasian girl, who gave him a son. But she died in childbirth a year or two later, and this left him rudderless again. His efforts to raise money became more and more pathetic. He married again-a mere child-wife. And finally he resolved to return to England to restore his fortunes. A fatal journey. Why, then, are these letters so fascinating? Chiefly because they throw light upon the social life of a hill- station in the early years of its development. At the time of Monk's arrival, Mussoorie was barely fifteen years old, the first residences having come up in the late 1820s. As far as I know, there is no other record or narrative of the hill-station's early years. And that is what makes it unique. There were many in Mussoorie who were more successful than Monk, but they have not left us any accounts of their lives or the lives of those around them. Only the traveller, Fanny Parkes, has left us with a brief picture of Landour and Mussoorie in those very early days. The Mackinnons, the Youngs, the Wilsons were too busy being successful and left us no written legacy. It was more than a decade later that John Lang, the lawyer and newspaper proprietor put down his impression of the growing town, in his colourful and exaggerated prose. Because Monk's letters were private and not meant for publication, they give us an authentic picture of the town and its early days. Lang was setting up his press in Meerut when our 'Mussoorie Merchant' was buried there. You won't find his grave in that vast city of the dead that occupies a corner of the old Meerut Cantonment; the inscriptions have worn away from most of the headstones. But in Landour's old cemetery you will find the grave of Elizabeth, his beloved wife. The tomb and inscription have stood the test of time. She rests in the shadow of tall deodars, facing the eternal snows. The documents in this collection all relate to the life of Mauger Fitzhugh Monk, who was born in 1815 of an Irish father and a Guernsey mother. After schooling in Guernsey and apprenticeship in Plymouth, he qualified as a solicitor in 1836. But within a year he was serving in the East India Company Artillery under the assumed name of Gunner Fitzhugh O'Reilly. His three years in the ranks, his "restoration to respectability" as a schoolmaster, his agonised indecision whether to marry a beautiful girl of mixed race, the tragic course of their subsequent marriage, his disastrous business venture as hotelier and entrepreneur, his mysterious and sudden decision to return to England and his equally sudden death en route in 1849, form the substance of this volume. 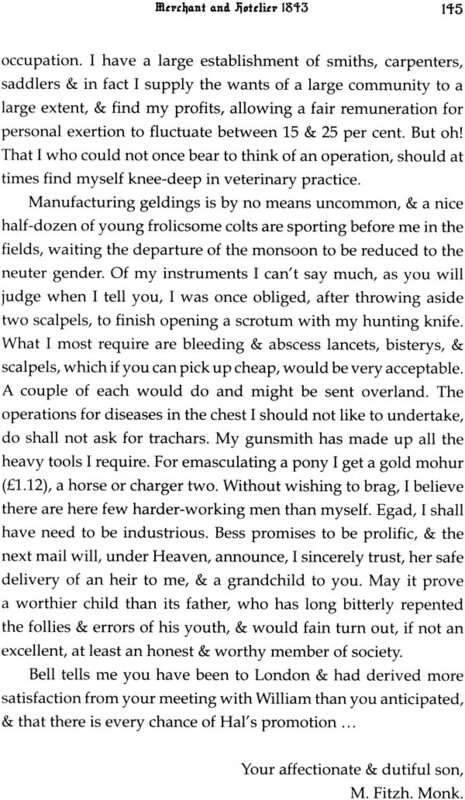 The story is bizarre enough, but piquancy is added by its being told, like an eighteenth century novel, in 'an epistolary style'. The chief interest of these letters lies in Mauger's own character. Complex he certainly was. Dreamer, would-be scholar, entrepreneur, aspiring gentleman, recurrently reformed penitent, and near conman, he could play all these parts. Was he just a charming rogue? For sure, he had kissed the Blarney stone. He had the skills of a conman, but not the disposition. He could coin a good cliche, and could play the part of a ham actor when he thought, often wrongly, that the occasion demanded. But however distasteful to us his self-abasement before his father, and however self-deceiving his protestations of good intention, the man had 'Style'. This is evident even before Hannah Toussaint tells us so in the last letter of all. For Mauger may not quite have had panache or braggadocio, but breath-taking effrontery he did have. As a result, it is easy to overlook his enterprise and the range of his talents, and to ignore his diplomatic skills when being pressed by the parties in Guernsey to take sides in their quarrel. It is also easy to belittle his resilience. Mauger always bounces back. A man of more brittle temperament might have taken his brother William's path-suicide. But temperament apart, his greatest asset was a surprising one for a self-confessed moral coward. Despite catastrophic lapses, he did have reserves of moral courage, and on some critical occasions used them. For example, when he was at a low ebb in 1844, in broken health and facing ruin, he stood by his family and started again as a schoolmaster. A real cad would have disappeared. Or was this a case of Mauger pursuing, as always, the line of least resistance? The argument about him could be endless, but of one thing I am sure: I would not have bought anything, new or second hand, from him ... well, not more than once. What does not appear in these letters? The biggest gap concerns the years 1837 to 1840, when Mauger was serving as Trooper Fitzhugh O'Reilly in the Artillery. We get a few glimpses [e.g. Nos. 26, 27 & 33] but that is all. And then there is 'the dog that did not bark', the subject that is just not mentioned, even though there is opportunity enough. Both Monks and Magraths had come from Ireland. Mauger's father was born and brought up there. Nicholas Magrath also. There were first cousins still living there, and Nicholas's own father and brothers were farming in County Longford. Letters in this collection make mention of the Potato Famine, both in Ireland and elsewhere, and of the suffering of the poor all over northern Europe; but no concern is expressed about the plight of their own kin. There is mention of cousins everywhere in the world but Ireland. Why the silence? The social historian of the British in India could find much of interest here about the hill stations of Landour and Mussoorie in the 1840s, and about Rajpore, which lies at the foot of the hills on the road to Dehra. The odd shaft of light is thrown on the life of a Company's soldier at Dum Dum and Meerut, and there is a deal of reflected light from St. Peter's Port, Guernsey. A couple of glimpses of life in early New South Wales could be of interest to students of Australian history. The letters themselves reached me in two batches, a few years apart. The first, known to be incomplete, came from my late cousin Una Monk who generously lent them to me. The missing second batch came to light later in the attic of another cousin, Dr. James Monk, who, like Una, was kindness itself in letting me have access to them. The reunited batches are now in the safe-keeping of Jim as head of the family. Most of the letters are written with the lines overlaid at right-angles, and on both sides of singularly thin paper. Luckily Mauger's expensive education had given him a clear hand. This volume may never have seen the light of day without the support of Professor Alan Macfarlane. I owe him a very special debt of gratitude for his generosity. Finally, I shall be glad to hear from any readers whose own interests and studies intersect with the matter of these letters.